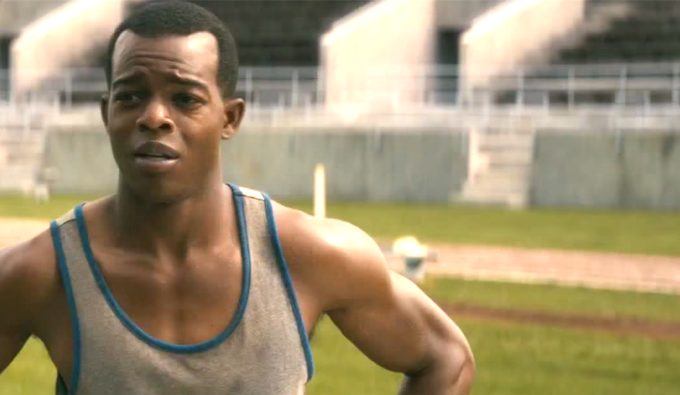 Capone talks to RACE lead actor Stephan James about Jesse Owens and wanting to play Spider-Man!!! 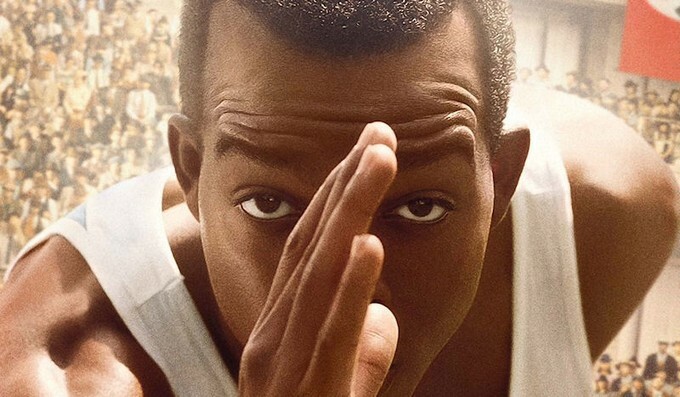 This week’s release RACE is not just about the record-breaking Olympian Jesse Owens, whose crowning achievement was traveling to Berlin in 1936 and providing Hitler and the Nazi party the necessary smackdown when it came to their ideas on racial superiority. RACE is also about the events surrounding that epic face off during an Olympics that America and many other nations nearly boycotted. We see the behind-closed-doors meetings between the U.S. Olympic committee (represented by Jeremy Irons and William Hurt) and the Nazis, forcing them to back down on their policies about letting Jews and non-white competitors in the games. Both strange and fascinatingly enough, the film also focuses on filmmaker Leni Riefenstahl’s (Carice van Houten of “Game of Thrones”) crusade to capture the games on film, no matter who won. Capone: Good to meet you, sir. 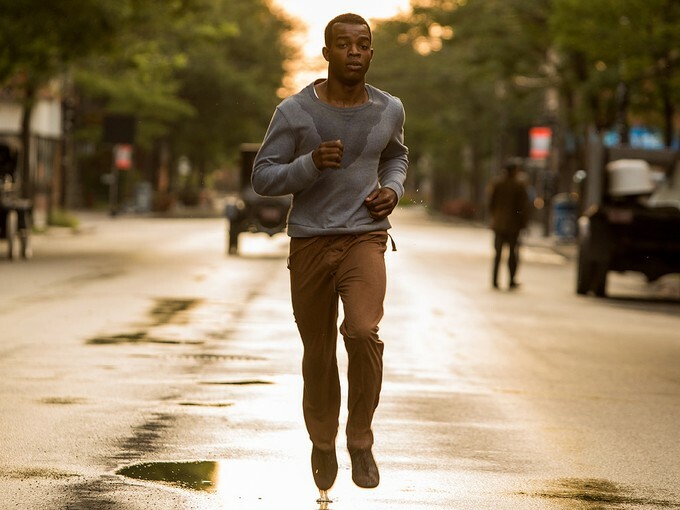 Stephan James: Good to meet you. Capone: As an actor, there’s a balancing act here, because you want to play this character as a human being—that’s all he was; that’s all any of us are. At the same time, you have to remember that we remember him now for a reason. He’s also an icon What do you remember about striking that balance and trying to not play him as a god but as a person? SJ: Yeah. Well, it was very important to me from the beginning to bring a level of humanity to Jesse. There’s so much we can find on the runner he was, the super human athlete. You see all these clips and videos of him leaving people in the dust, but what do you know about him as a man? As a husband? As a father? As a humanitarian? As I started to learn about him from hanging around his daughters and his family, those are the things that appealed to me even more. So I felt a huge responsibility to bring that to the screen, bring that to the story. We see moments of Jesse in the most human form. We see that he’s not perfect, and despite being this larger than life figure, he has his flaws. I tried to just be as human as possible in that regard and make him relatable. Capone: What were some of the things specifically that you wanted to make clear about him and his flaws? The script is written, so I’m wondering how much were you actually able to include? SJ: Well, we see his modesty. People don’t know his personality. We see how modest he is. He wasn’t too outspoken. When he ran his races, he wasn’t overly emphatic, even though he was just crushing it out there and breaking records from the time he was like 15 years old. It’s small little things, but it’s things I had to make sure I was including and bringing to the film. Obviously, the script is already written, and there are things that are imbedded into the script that show him as a human being, but for me, it was just about carrying his persona and his charisma, and hanging around his daughters really helped me gain that. I felt like I was a part of their family. Capone: As much as the world was watching and the United States was watching, in particular, it seemed like most of the pressure on Jesse was coming just from wanting to please his family. He was the first one to go to college. Those were the most important to him. 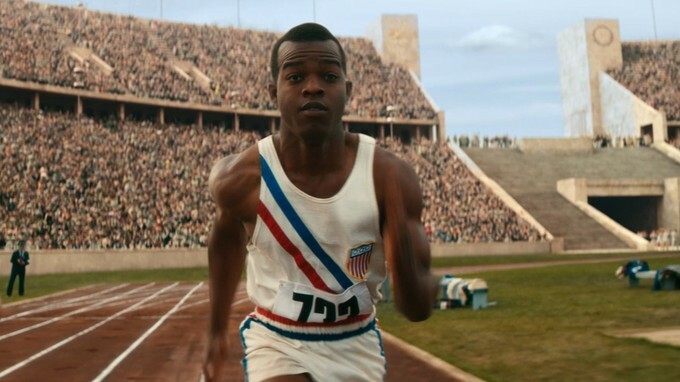 What do you think the importance of Jesse Owens’ story is to a modern audience? What do you want people thinking about beyond the history? SJ: Yeah, this film isn’t just a big history lesson. People are genuinely enthralled. I see younger children who are just so caught up in his story. Especially when he’s racing, they’re on the edge of their seats watching him win race after race. For me, I think the biggest takeaway is you look at a guy like Jesse Owens and what he was able to do in 1936 in Nazi Germany when everything in the world was against him. He wasn’t a guy who had much. He was the youngest member of eight brothers and sisters and he had to support them. Not only did he have to support them, but he had to support the family he made for himself in his wife and his daughter. It’s really a testament to the type of person that Jesse was. He had a lot on his plate and a lot in his way, but he stared in the face of adversity and overcame it all. You’ve got to look at it like that. If he can do what he did in the time in which he did it, then there’s really no excuse for you and I not to accomplish anything we want to accomplish, right? Capone: I was actually genuinely surprised—because they don’t play this up as much in the commercials and trailers—how much of the film is devoted to the behind-the-scenes stuff, both with the Olympic Committee and the whole Leni Riefenstahl angle. Did that scene at the end where she’s staging that jump so she can film him better, did that really happen? SJ: Yeah, yeah. And her whole story could have been a whole other film. SJ: Totally. She was just fascinated with Jesse. Really, really fascinated with him. We see that in the film that she made, OLYMPIA. She made about a four- or five-hour film, and Jesse is a pivotal part of that whole film. Very, very interesting to see and to see all the things that were happening. It’s so much bigger than just a racial thing we are talking about in this film. Despite the title, there’s race as in running, there’s race as in black and white, but there’s race as in the human race, and we see issues like that all across the board. Capone: Again, that’s almost the biggest slap in the face to Hitler that this movie has, even more than Jesse winning is that Long was a good sport about losing. Talk about that aspect, because that was a great little turn in the film. SJ: Yeah, it’s one of the biggest take aways from the film. You look at a guy like Jesse and a guy like Luz—guys who come from very different places and look very, very different, obviously have very different backstories, but for them to meet in Nazi Germany during the Olympics and form the bond they did, something so, so special. Really, just two guys who could have used everything in the world around them to separate them. There was so much around them to separate them, but they found the one thing that really united them and connected them and that was their love for running. They both had an appreciation for each other as athletes and as men, and a love for one another. They remained best friends for the remainder of his life. Capone: Right, that was a nice little touch to find that out at the end. Part of your background was as an athlete, but I have to imagine this is a very specific type of training. Not just endurance, not just learning to run, but to make it of the period. You have to wear these strange shoes. I don’t know if running looked differently than it does today, and Jesse might have done it differently than other people did it. What were the combinations you were working with as far as the training? SJ: I grew up playing basketball, football, so I wasn’t unfamiliar with being athletic, just never track and field. It was a whole new world for me, a whole different beast. It wasn’t enough to learn how to run fast; I had to do that. But I had to learn how to run like Jesse, because his running style was so particular. Then when you look at learning how to run like Jesse, you look at the conditions he was running under. Running on a dirt track in these leather shoes with really flat-bottom soles, and three-inch spikes on the bottom of them. It blows you away when you wonder, how did he do what he did in those shoes, in those conditions? That’s the way I had to train, because I had to be accurate to the time. I was really wearing those shoes when I was running in the film. For me, there are so many different layers, and again, small, small things that from the naked eye people can’t really tell, but I had to pay attention to. I had to pay attention to how he started, how his stride looked, how his facial emotions looked how he ran. There’s a lot of things he did wrong as a runner that he later on corrected. You see that in the film. He works on his stride. He would pop straight up after the gun went off rather than having a natural glide to his stride. So I had to learn how to do it the wrong way then learn how to do it the right way. So there are layers to it all, but you have to pay attention to the small details to be accurate. Capone: What’s your best time in the 100 yard? SJ: I think I did the 100 in like 12 seconds, which is decent. Jesse was running yards. Capone: The bond that you and Jason Sudeikis have in this, it’s not quite father-on, because their ages are too close, and there’s very little discussions about race between them. What did you guys do even before shooting just to know each other and be in a place where you could be that comfortable around each other? SJ: Funnily enough, when I met Jason, I flew out to New York just to hang out with him a bit. Really, we never spoke about the film [laughs]. For the first couple of days of knowing each other, we spoke very little about the job we were going to have to do together. He was a big sports guy. I’m a big sports guy, basketball and baseball, so we connected on that front pretty much right away. He played basketball growing up so he knows what it’s like to be an athlete and to be coached. So we know the dynamic between coach and athlete so it just worked. He’s an easy guy to get along with, a real chill sort of person. As Jesse and Larry get closer in the film, Jason and I just got closer in real life. It was real authentic and nothing was forced. We just clicked. Our personalities just worked. Capone: I realize some of it is CG, but that scene where you first walk into the stadium in Berlin, that alone would have caused me to wilt under the pressure. Where did they shoot that, and how much of that was real? SJ: Very, very little. The scene you're talking about is like a five-minute shot, it doesn’t cut. Capone: So there was no building at all? SJ: No. They had built a structure for the entrance, but in terms of what was out there, maybe 20 extras, but you’re seeing 150,000 people in the film, right? So for me, that was a scene I discussed with the director fairly early on. It was important to make sure we put the audience in Jesse’s shoes in that moment. I didn’t see a big blimp flying over my head; I didn’t see 150,000 people doing the Nazi salute. I didn’t see or feel or have any of that, but I realize the importance of it. Obviously, the effects make it look great. Capone: Tell me about the first time seeing it finished. SJ: Blown away. Absolutely. Yeah. It’s incredible. But again, we discussed that scene months beforehand and why it was important to put the audience in that moment. So I’m happy with the way it turned out. Capone: If I remember correctly, the first time I heard anything about this film—and I know at one point there was a competing project—is when John Boyega was cast in the part. It doesn't seem like he had it that long. I think he realized his time was going to be slightly limited. But how much time did you actually have between the time they tapped you to do it and shooting. How much time did you have to prepare and train for it? SJ: A couple of months. 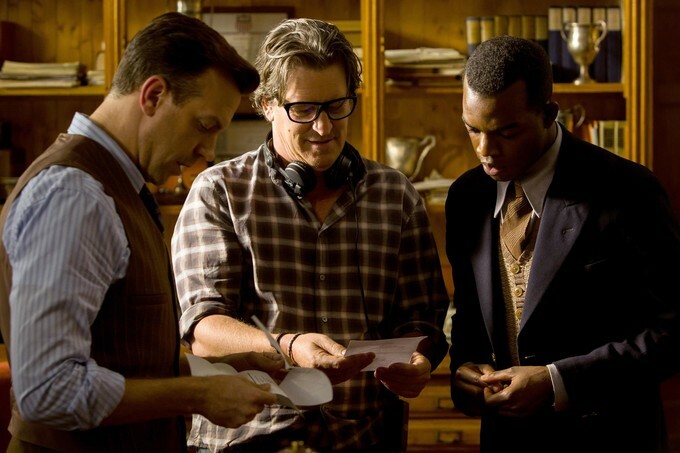 I had gotten the role even before I started filming SELMA. Capone: So you were able to train a little in Atlanta? SJ: Yeah, I was training while I was filming SELMA for sure, going down to Georgia Tech. It was about two months beforehand I knew I had the film. Mentally, I was still in a space where I was playing John Lewis [in SELMA], but physically, I had to do something to make sure that I was going to be ready for the next one. Capone: The relationship obviously that Jesse has with Minnie Ruth is also the key relationship in his life. We were talking before about his flaws—I got a sense that a part of him felt bad for leaving his family for such long periods of time. Talk about the significance of that relationship in the context of this film. SJ: Well, Jesse and Minnie Ruth were best friends from the time they were about nine-years-old. So there wasn’t really a person that Jesse cared for or was closer to than his Ruth. He was a big, big family guy. His wife and his children meant a lot to him. She was a big reason why he ultimately decided to go to the Olympics, to those games. No ones opinion mattered more than hers. She believed that Jesse was the most talented, fastest man on the planet and that he should go to those games because that’s what he loved. He loved to do it. It’s a real testament to him and to their whole relationship and just how strong their foundation is that we see him on the road straight off, but he’s able to come back and make things right with his wife and his family. Obviously, they ended up having a very long marriage until Jesse’s death in 1980. Capone: Do you remember any big surprises about his life that you came upon either from talking to his daughters or in your research? SJ: I was surprised to learn some of the things about how he was treated after winning. Not that that really helped me in the film, just because we don't show too much of that. We show just after he comes back. Just little personality things about the humanitarian he was and a real genuine sort of individual, and that’s what I took the most. Capone: Do you know yet what you’re doing next? Capone: That would be awesome. SJ: We’ve got to pull some strings. Make it happen. Thats’ where my sensor is set. Capone: You’d love to be a part of that? SJ: I’m so serious, man. That is not a joke. I’m very, very serious. Capone: I know there was a TV pilot you were involved with recently. SJ: “Unveiled”? That’s just a pilot. Capone: NBC didn’t pick it up? It’s an interesting concept, especially when you consider the people who were running it. SJ: Yeah, Mark [Burnett] and Roma [Downey] were incredible, the best bosses I had at the time. I guess it just didn’t pan out. The network certainly has plans to reboot it or something like that. I don’t know if I’ll be a part of it. Capone: That’s the last thing I remember reading about it, was that they were rebooting it, but they were keeping some of the actors, including you. SJ: Yeah, they ended up keeping me, but it just never ended up playing out. But like I said, I think in the new year, this year, they have plans of restarting it all. Whether I’ll be available, I don’t know. Bust of luck to Mark and Roma and their people. Capone: Spider-Man. That’s the story right there. SJ: That’s it right there, man. You got it. Capone: Have you had any conversations with anyone about that? SJ: I tell everyone that, man. It’s honest. It’s true. Capone: It’s not like the comic books haven’t make that possible. Capone: Anyway, it was great to meet you, Stephan. SJ: Pleasure. Thank you so much.